MAKing STUDYING AT NIGHT EASIER. 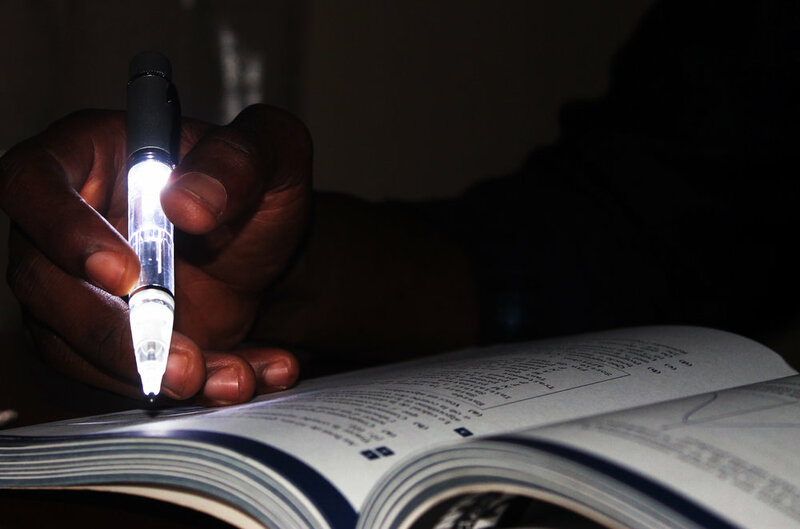 Bright Future brings light to the conventional pen to make power-deprived students more productive. According to the World Bank, 6 out of 10 people in sub-Saharan Africa do not have access to power. With 60% of the African population being below age 25, the youth is mostly affected by this problem, especially when it comes to education. The lack of access to power plays a major role in decreasing student productivity and lowering passing rates. Bright Future is looking to partner with companies in the private sector and nonprofit organizations as well as government agencies in order to get Firefly Pens in the hands of many. Let's unlock change together through synergistic partnerships. Make a difference today by donating a Firefly Pen to a student with limited access to power. In an effort to support Bright Future's larger mission of promoting economic empowerment through education, we are offering scholarships to help disadvantaged high school students through their college applications.